SLZ and Associates designs, maintains, develops and supports many different types of Internet sites. Some or all of the Legal Pages referenced at this site may be incomplete, but are necessary when doing different forms of business on the Internet. If something is incomplete, please check back at a later date or contact SLZ and Associates by phone or through any support links, should you have any questions about any of the pages referenced from this Legal page. In all cases, Internet sites used for business purposes do require some or possibly all of the above listed pages, depending on the type of business site. This page was created to let you know that SLZ and Associates does believe that acceptable use practices are essential for every Internet business site. 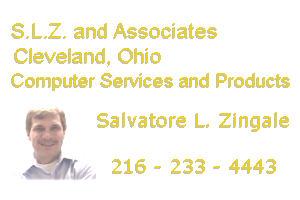 Since the possibility exists that any site currently controlled or used by SLZ and Associates may have referred you to one or more pages at this site, while a site may be lacking one or more the necessary pages, you should in all cases contact SLZ and Associates via support or phone to resolve any issues that are not clear to you. Internet sites used for personal reasons may not require any of the above listed pages.